In the past two years, Swiggy, the Naspers, DST Global and Bessemer Ventures-funded restaurant aggregator, has been on a tear. The number of interactions on its platform since October 2017 has gone from 2 billion (across consumers, riders and restaurants) to 40 billion in January 2019. In that time, Swiggy has gone from a business working with 12,000 restaurants to over 55,000; from seven cities to 70; from delivery staff of 15,000 to 120,000. The Bengaluru-based venture has become far more value too .. from $700 million in February 2018 to $3.3 billion by the end of the year. This dizzying growth has meant that Swiggy, a firm founded as recently as 2014, has to look beyond human intervention to keep pace. In India, Swiggy is hardly the first techstar to bite the AI apple. 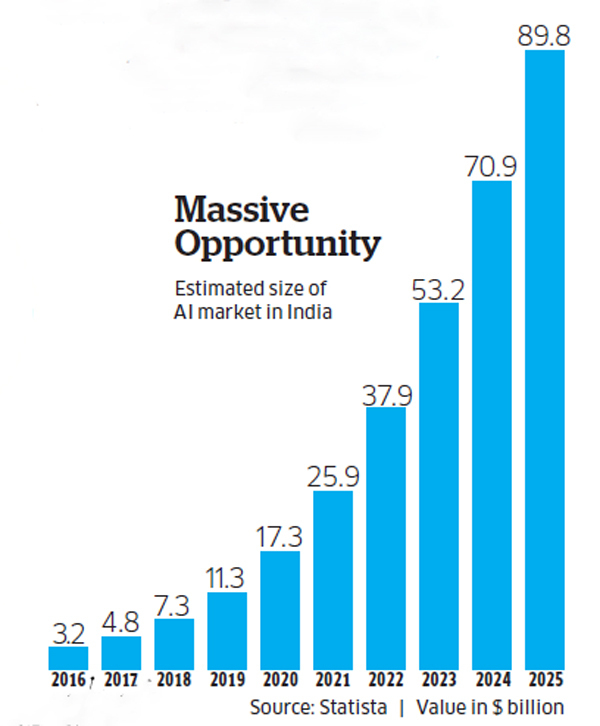 Previously, Google, Walmart Labs Flipkart, Paytm, Oyo and several other global and homegrown players have all invested in and acquired companies to boost their presence in AI. For much of the past few years, startups and large companies have been running relatively small experiments with AI. Now the momentum in the space is accelerating, as evidenced by a flurry of deals as well as by in-house budgets at unicorns being diverted in this direction. AI has become something of a magic wand to wave at all tech problems, even as there’s widespread debate around its utility and optimal applications. Startups focusing on niche areas in AI are receiving investor backing, ventures with strong AI capabilities are now beginning to win deals and customers beyond early pilots and, most notably, specialists in the field, especially data scientists, are in high deman. 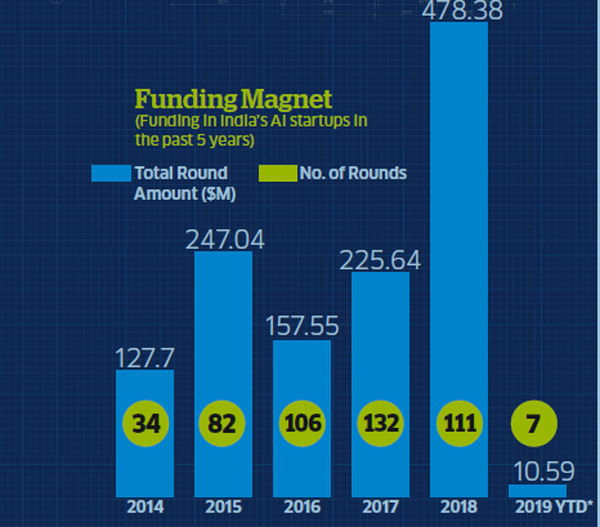 “At least 25-30% of the proposals we now get involve a significant element of AI,” says Girish Shivani, executive director at YourNest, an early-stage venture capital firm with interest in so-called deep-tech startups. Kris Laxmikanth, CEO of Bengaluru-based HR firm Headhunters, says that the market for talent with AI-linked skills is becoming overheated. Salary jumps of 100-150%are becoming the norm to lure away an established data scientist. There are also instances of Indian AI startups relocating to Silicon Valley in the US for want of relevant talent here. “AI is a hot skill today. I will even call it super hot. It is hotter than what SAP was in its heyday. In Silicon Valley, an AI engineer can get between $135,000 and $160,000. This is the highest paying skill today. In India, a fresh engineer with AI skills starts at Rs 8 lakh per annum in top software services companies such as TCS and WiproNSE 0.09 %. After one year, they can command 50-80% increase if they have the exposure to right projects like chatbot building. At global tech companies such as Google, these salaries are higher,” says Laxmikanth. “... for entrepreneurs, we are working on an accelerator programme, based in India, focused primarily on AI/ML technologies. Our global accelerator programme has already supported over 30 Indian startups of which six are focused on applied AI/ML innovation,” Google India noted in a blog post in March 2018. The interim finance minister, Piyush Goyal, announced the establishment of a puter to understand language as spoken by humans), Google is making deeper inroads into the Indian market.